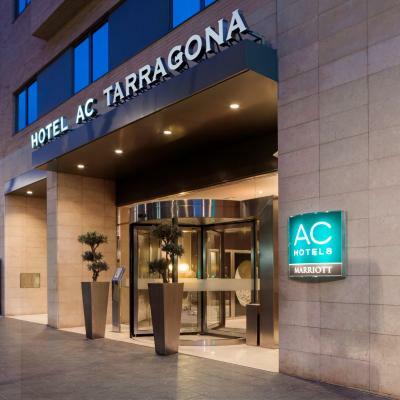 Lock in a great price for AC Hotel Tarragona, a Marriott Lifestyle Hotel - rated 8.3 by recent guests. The staff was very helpful and friendly. Location is very good as well. Recommended. The location was good, regarding both our venue and the access to the sightseeing. The big shopping centre is very close if you keen on shopping. Also the bus station is next to the hotel, so easy to get there directly from Barcelona airport. The room was quite big and quiet. The bed was comfortable with good pillows. WiFi worked well. Staff very nice, room comfortable and well equipped. The room was spacious and nice. The people at the reception were friendly and helpful. The bed was exceptional! So so comfy! Bathroom clean, great shower and qjite nice! Bathroom clean and spacious. Bed is confortable and soft. Good location for walking and sightseeing. Cheep nearby parking. Wifi and safe free. Breakfast excellent. Lifts quick and silent. Room very clean. AC Hotel Tarragona is located in the UNESCO World Heritage City of Tarragona, next to Ciutat Park. 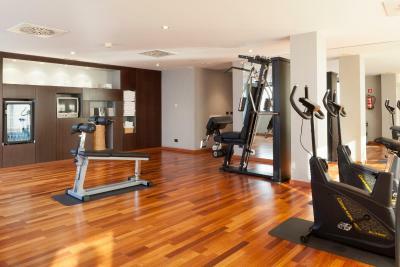 It offers a fitness centre with Turkish baths and free WiFi throughout. The air-conditioned rooms at the hotel feature parquet floors and comfortable furniture, as well as satellite TV.. Each one has a minibar with soft drinks. The hotel's AC Lounge serves a varied menu which includes salads, main dishes and desserts. AC Hotel Tarragona, is 350 yards from Parc Central Shopping Centre and Tarragona Bullring is 550 yards away. The bus station is 100 yards away. AC Hotel Tarragona, a Marriott Lifestyle Hotel has been welcoming Booking.com guests since 15 Jan 2010. When would you like to stay at AC Hotel Tarragona, a Marriott Lifestyle Hotel? This air-conditioned room has a modern feel, with parquet flooring, monochrome décor and comfortable furniture. It includes satellite TV, a telephone and a minibar. The bathroom is stocked with free toiletries and has a bath and a hairdryer. Private parking is possible on site (reservation is not possible) and costs EUR 13.31 per day. This triple room features a minibar, air conditioning and sofa. This new 115-room hotel offers an excellent option for both business and leisure trips. Fully-equipped function rooms, a fitness centre with Turkish bath, and parking garage are all part of this hotel in the city center of Tarragona. House rules AC Hotel Tarragona, a Marriott Lifestyle Hotel takes special requests - add in the next step! AC Hotel Tarragona, a Marriott Lifestyle Hotel accepts these cards and reserves the right to temporarily hold an amount prior to arrival. Please take note that Lunches and dinners will be closed from 30 July – 12 August. You can use AC Lounge/Room Service. The breakfast time on Holidays is from 8:00 to 11:30.
wifi very slow, had to use my phone as hotspot. AC difficult to operate, wouldn't go below 20 degrees so room felt stuffy. The tiles of the bedroom floor were popping up and the A/C was not working well. My door was also knocked on by hotel staff at 11pm. I wouldn’t stay here again. Buffet price a bit expensive for kids, other than that we had a great stay! The room was older than the one I got last time. The choice of channels on the tv is very (!!) poor. The room was a bit shabby. There was no kettle in the room and you can't order tea or coffee before 7 pm. Breakfast has no vegetables but for smashed tomatoes. Entrance to parking if you have a wide car, very tricky! Bacon at breakfast very hard and chewy. A bit faraway from the center but you could see it from the map before book it. Stuff was ver helpful. Room was comfortable. Very nice hotel with large/modern rooms and clean. Breakfast is very good as well.